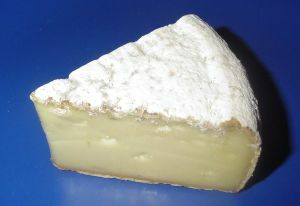 Tomme de Savoie is a variety of Tomme cheese from Savoie in the French Alps. It is a mild, semi-firm cow's milk cheese with a beige interior and a thick brownish-grey rind. Tomme de Savoie, like most Tommes, is usually made from the skim milk left over after the cream is used to make butter or richer cheeses. As a result, the cheese has a relatively low fat content. The cheese is made year-round, and typically has a slightly different character depending on whether the cows are fed on winter hay or summer grass. The cheese normally comes in discs approximately 18 centimetres across, 5–8 centimetres in thickness, and weighing between 1 and 2 kilograms. It is first pressed, and then matured for several months in a traditional cellar, which produces the characteristically thick rind and adds flavor.